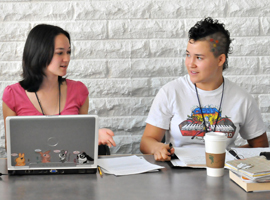 The CSSSA Creative Writing Program offers personalized and interactive workshops for approximately seventy talented and motivated young writers. 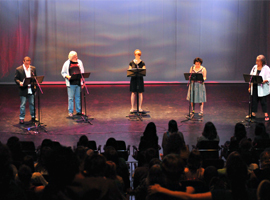 A faculty of four professional writers and educators guide and instruct students in the techniques of fiction, poetry, non-fiction, and dramatic writing. We’re looking for students who have the courage to be themselves on the page. We’re looking for students who love language. We’re looking for students who want to tell their own stories: stories from their imagination, from their neighborhood, from their family. Ideally our students have begun to outgrow the High School reading list. They have struck out and found the writers that speak to their own inner life and experiences. Whether it’s edgy YA, slam poets at the local cafe or on YouTube, European novelists, or the latest New York playwrights, CSSSA students tend to have a list of writers they love. We’re also looking for students with discipline and endurance. 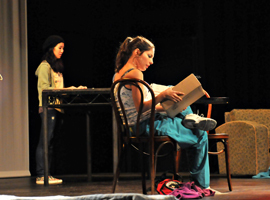 CSSSA is one of the most free, creative environments a young artists can experience. It is also a great deal of hard work. During the course of the four weeks you will write and workshop more than you ever have in your entire life. Be ready. Core is a foundational writing workshop that meets four mornings each week. Students will spend one week with each member of the faculty. Faculty members will teach their specialty, offering an introductory class in prose fiction, poetry, memoir, or dramatic writing. By the end of the month, every student will have had a class in every genre. Electives meet four afternoons each week. 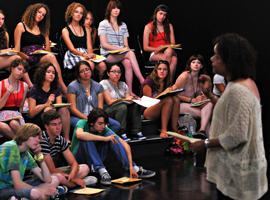 These workshops provide students with an opportunity to go deep in a particular genre or approach to writing: poetry, drama, fiction, and non-fiction. Students will choose their elective during the departmental orientation. Published writers, editors, agents, and select panels are invited to CSSSA for workshops, discussions and presentations. 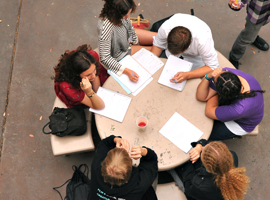 CSSSA Creative Writers have the opportunity to participate in lively discussions and learn creative strategies from nationally recognized writers. On Saturday mornings the Creative Writing department gathers to hear students to share work created during the prior week. Faculty members describe the writing exercises, their purposes, and the problems and discoveries made by the writers. Every week students will work together on group projects. These might include creating a play, writing group poems, or working together to tell stories from their lives. This is a chance for writers to get out of their heads and learn that writing isn’t only about what happens on the page. Creative Writing students have the opportunity to contribute work for the CSSSA Creative Writing Anthology. Our anthologies live on as a demonstration of the exceptional work produced by CSSSSA Creative Writing students each summer. 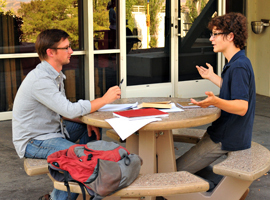 Every week during Writer's Desk students will have the opportunity to drop in for office hours with the Creative Writing faculty. This can be a time to go over student work, discuss future projects, and find strategies to deal with the CSSSA workload. Hilary is a poet and scholar of English literature with an emphasis on Shakespeare, the Victorians, and the multi-cultural tradition of fairy tales. She earned a BFA in English Language and Literature from Smith College and an MFA from the Writing Program at CalArts. Currently holding both faculty and administrative positions at CalArts, she teaches and mentors students in language arts and is the Director of Summer Institute. She is the author of Apologia, a collection of poetry excerpted in various publications and online journals. Literary honors include the Academy of American Poets University Prize at Portland State University, the Foote Memorial Prize in Biblical Studies, and featured writer in Kurt Vonnegut’s master class at Smith College. In addition to maintaining a personal writing practice, she supports her community by volunteering at schools and local non-profit arts organizations. Phinneas Kiyomura is a playwright, screenwriter, and actor from Long Beach, CA. His plays have been produced at Theatre of NOTE, Padua Playwrights and Sacred Fools. He is a FIND Screenwriters Lab Fellow, an ABC Disney Writers Lab Fellow, and was a staff writer on Twisted (Freeform). As an actor, he will appear in upcoming features Kill, Me Deadly and After We Leave. He is currently developing Internment, a passion project inspired by his father’s experiences in the Internment Camps, as well as his pilots for New Regency, Mark Gordon Company, and ABC Studios. His graphic novel, 442, will soon be released by Stēla. Diana Wagman is the author of six novels, most recently her first for young adults, Extraordinary October. Her second novel, Spontaneous, won the 2001 USA Pen West Award for Fiction. Her fourth novel, The Care & Feeding of Exotic Pets, was a Barnes & Noble Discover New Writers selection. Her short stories, essays, and reviews have appeared in the New York Times, Salon, various journals, and as part of the n + 1 anthology MFA vs. NYC. She is an occasional contributor to the LA Times. She currently teaches fiction for Writing Workshops LA. Alex Mack is a Los Angeles based veteran and writer. His long-form work utilizes the basic physicality of contemporary American society to examine and demonstrate the devolution of man. Alex is the author of a memoire, The Deputy of Nineveh, tracing his year-long deployment in Iraq through the bloodiest period of the war. Alex has also written Doggerel, a novel which follows his character through drug-addled delusions and a criminal life in Spain, as well as his latest work, The Summer of Sixteen, a novel examining the virtues of abstinence and concepts of self as a court stenographer hunts down a serial killer in Los Angeles.